1. Kite flying…no child’s play soaring in the skies…a shot taken on the premises of Alexander Graham Bell National Historic Site on the shores of Bras d’Or Lake at Baddeck, Nova Scotia. Alexander Graham Bell was a Scottish born scientist, inventor and innovator credited with patenting the first practical telephone and founding AT&T in 1885. The topography and climate of Nova Scotia (New Scotland in Latin) is similar to Scotland. Alexander Bell moved to Canada and commuted between Canada and USA. The Historic Site showcases ‘how air and water captured Dr. Bell’s imagination and how ideas led him to send sound on light and create a treadle powered sound recording device, man-carrying kites, airplanes and a record setting-hydrofoil boat’. A perfect family outing destination. Baddeck is a picturesque vibrant town famous for the looping Cabot Trail, a magnificent scenic drive along ‘the most stunningly beautiful coastline in the world’.. Our 10 day road trip (June 7-17) starting from Halifax, capital of Nova Scotia traversed across the three tiny provinces of Canada’s east coast…..Nova Scotia including Cape Breton National park, Prince Edward Island (birthplace of Canada) and New Brunswick. Another ‘serious’ sporting event on my Canada trip 2017 itinerary was the Calgary Stampede in Calgary, Alberta. This ‘Cowtown’ annual event called ‘the Greatest Outdoor Show on Earth’ due to its volume and speed is one of the world’s largest rodeos peppered with non-stop entertainment, whacky cuisine, games and shows. The Stampede is flagged off with the Parade followed by rodeo events and competitions held for ten days at different venues and concluding in prize distribution. Evening is time to loosen up at the Stampede grounds to watch various races, live entertainment and daily fireworks. A cultural tsunami is let loose on the city and unresistingly one is drawn to the spectacular presentation. I took pictures of events I attended, the Parade, the horse show at Spruce Meadows and an evening show at the TransAlta Grandstand in Stampede grounds. I preferred to watch, on television, the grit and gory Cow Town competitions where around 120 athletes competed for tournaments from bare back riding, steer wrestling, bull-riding, ladies barrel racing, horse racing etc. 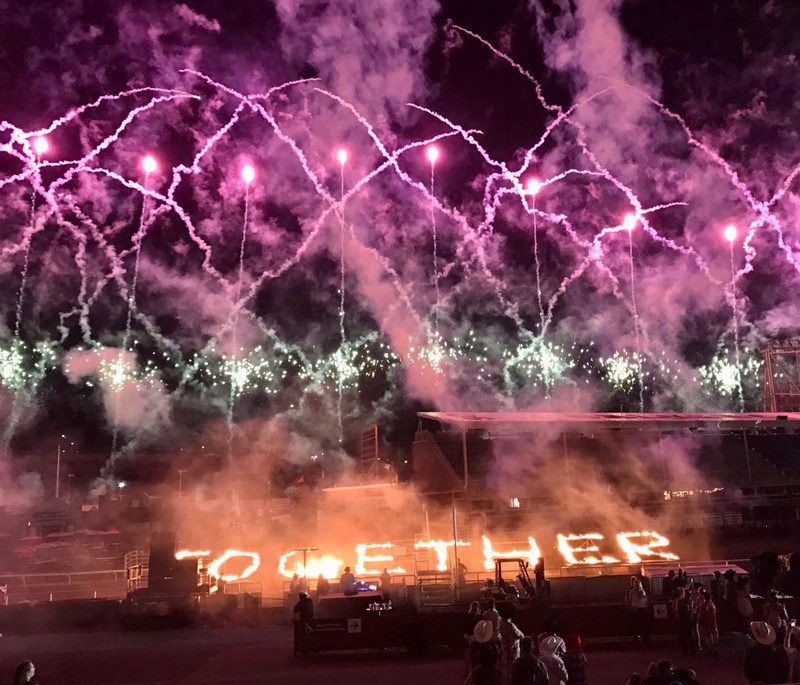 One achievement of 2017 Calgary Stampede was the inclusive ‘Togetherness’ with First Nation people. While another face was the activists wanting a stop on what they termed ‘animal torture’ as cattle and horses suffer casualties in the extravaganza.